Try and capture the crooks with these all-new Lego City police sets. This time the police have a better advantage of capturing the bad guys with their all new airplanes, parachutes, and flying suits! But there are new crooks in Lego city and those crooks are causing a lot of trouble with there parachutes, airplanes, and drones! And You can save Lego city if you buy these sets! With this set, you can build an armored police transporter with opening roof, a safe, a jail cell and an all-new light and sound brick to alert the crooks your there! On the other hand, the crooks have a helicopter with spinning rotors to have super cool high flying action! With the cops flying suit, help retrieve the diamond and put it in the safe to keep it away from the crooks. 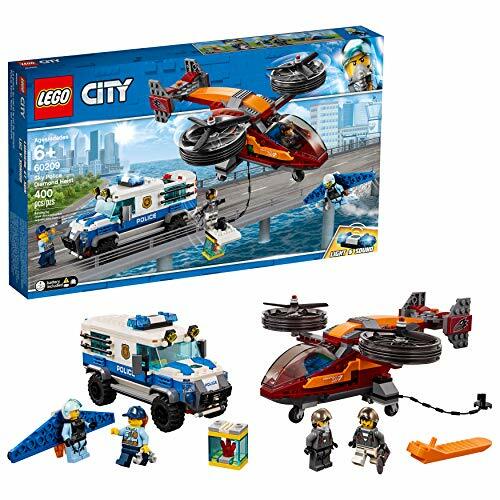 Build an armored police transporter with opening roof, new-for-January-2019 light and sound brick, jail cell and gem safe, plus a crook's helicopter with spinning rotors and a toy police winged jetpack for amazing high-flying action! golden mini-figure statue. 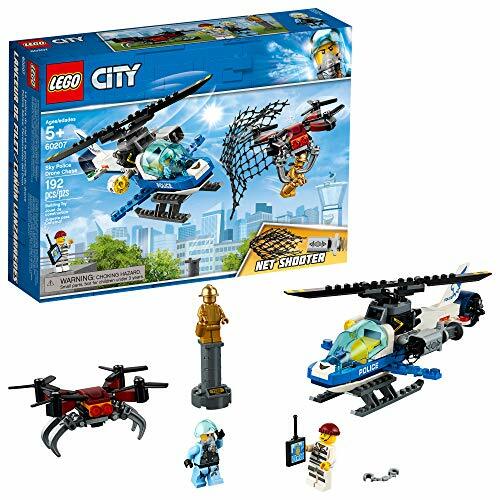 Includes 3 LEGO City mini-figures: a crook and a Sky Police officer figure, plus a golden minifigure statue. Hurry and Build a police helicopter with an opening cockpit, spinning rotor, searchlight, and an all-new spring powered net launcher to shoot down the drone and catch the crook! Build a feature-packed helicopter with opening cockpit, spinning rotor, searchlight and a firing net shooter to catch the buildable toy drone with spinning rotors and opening claws! With this set, you can build a three-level sky police base and send in the air police force to try and stop the crooks from helping their friend to escape out of prison! But first, you need to parachute in the sky police to stop the crooks 4-wheeler from breaking the prison bars. Includes 6 LEGO mini- figures: 2 crook figures, 2 police officer figures and 2 Sky Police officer figures. 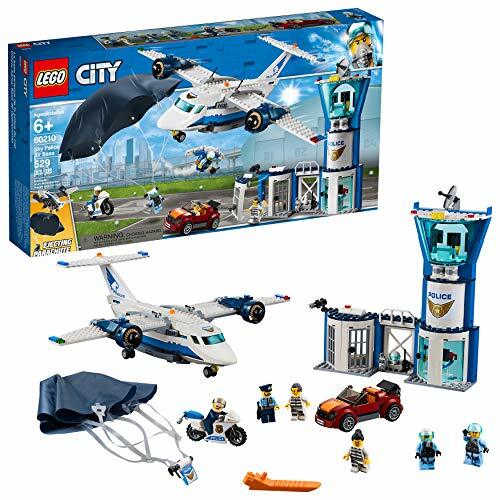 Build a 3-level Sky Police air base with control tower, jail cell with breakaway wall, large police plane, jetpack with foldable wings, working parachute and a getaway car for exciting police chase action! Fly the super-fast Lego jet plane with an opening cockpit and two rocket boosters to the crime scene and release the extending hook to catch the crook’s parachute and the second crooks four-wheeler. This set Includes 4 LEGO City mini-figures: 2 crook figures and 2 police officer figures. This set also has 218 pieces.